Being healthy is pretty much on everyones mind in january, whether it is a new years resolution (although I'm not a big fan of those) or simply eating too much over the holidays (big fan of that!). Now, I am not generally a person who eats a lot of rubbish, I have phases where I eat pasta almost every day which is partly because I'm probably lazy sometimes and cannot be bothered thinking about what to cook after a long day at uni. but also partly because sometimes I just fancy the same thing for a few days in a row. Since I started university and moved out this has been getting worse, I'm still eat relatively balanced and I cook for myself which I know is something many students don't manage to do, but still I wanted to try and introduce a bit more freshness into my daily diet, you know, to gain all those vitamins you need so desperately when trying to study. I spoke to my mum while I was home over christmas and after I told her what I usually eat, she suggested to have a salad with my meals more often, as it is easy to prepare and there are so many different varieties, Im also a big salad lover. I had though about this before but living by myself kind of made me think that making a main meal and a side dish just for myself would kind of be a waste. However, I came to realise that this really isnt true and definitely doesnt require much more time than just making one meal. I have since started to have a salad pretty much every day which not only makes me feel better because I know that it is beneficial to my health but is also a great way to create some nice recipes. its often those simple things that make you feel a lot better about yourself and this has definitely helped me. 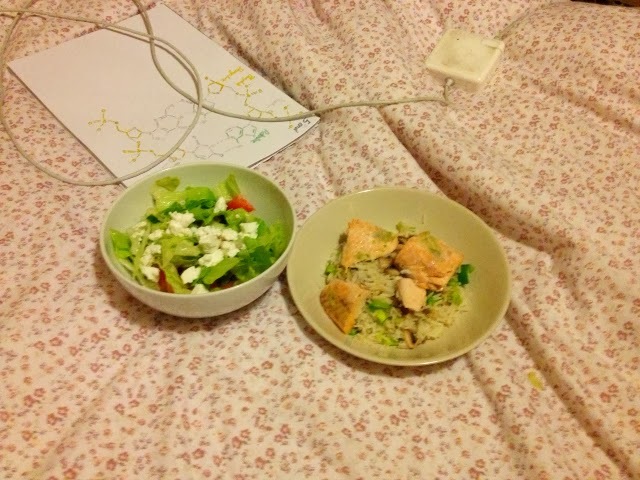 As you can see, good food was a part of my life even during revision, which I think is one of the most important times to eat healthily as your brain needs all the energy it can get.